Testimonials | Fusion Heating Ltd.
Our 24-year-old oil boiler decided not to play anymore a few weeks back so we decided now is the time to convert to gas. After having three gas fitters have a look at what was required I was starting to despair as all three had a different view on what was required. On a recommendation I contacted Fusion, and Alan arrived who impressed at once with his professional manner and depth of knowledge. As soon as the detailed quote arrived we contacted Fusion for an installation date. On the day of installation, the vans arrived on the dot and everyone went about their tasks with the minimum of fuss, even the cutting up and removal of the old, rather large oil tank. The whole conversion was completed in one day leaving us with a fully operational gas hot water and central heating system. A bonus being the wireless heating control system which is so easy to use. I would be happy to recommend Fusion to anyone who is looking for a professional gas installation team, with well-trained polite staff to whom I should like to say “thank you”. "I can attest to the professional skills of Fusion Heating having had my oil boiler system replaced with gas in Feb of this year. Pippa came to my house to inform me of what would be involved and I was very surprised when she said the whole job would only take one day as opposed to two or three as quoted by other installers. On the day in question an army of plumbers and electricians descended and to their word everything was finished by 4pm. When they left, the house was as tidy as it was before. Their work was immaculate and the workers were all very friendly. Fusion also offered me 0% finance which I took advantage of. My heating bills have decreased significantly as have my electricity costs since the installation. I can wholeheartedly recommend Fusion Heating to anyone contemplating moving to gas." “Fusion provides an outstanding plumbing and heating service offering 24/7 maintenance support. The level of service provided by Fusion gives our landlord and tenant clients complete peace of mind that their maintenance issues will be dealt with quickly and effectively and to the highest possible standard. Victoria Housing Estates had initially been working with Fusion to provide gas and oil boiler servicing to over 400 properties since 2011. In January 2017 this partnership was expanded based on very good performance and professional approach to incorporate all services including building, plumbing and electrical works on a measured term contract basis which includes 24/7 cover. In April 2018 VHE will be entering into a potential 5 year measured term contract with Fusion to provide all trades for our response repairs service. This contract was awarded following public advertisement in accordance with EU procurement regulations. I am writing to say how grateful we are for the team of four who were in our home yesterday to fit gas heating, a shower and a gas cooker. Not forgetting Alan who began the process in August and impressed us, not only with his ultra-calm approach, but his honesty and integrity in advising and directing our essential requirements. We were really impressed with the positive attitude of David and his team. They were efficient, helpful and considerate as they moved from room to room doing their work. Thank you very much for sending us this team of men who actually seem oblivious to how excellent they are. You should be considered for NI BUSINESS AWARDS! "Our gas conversion was done on Friday Past. Just wanted to say how impressed I have been with your company from start to finish. Your surveyor was lovely & so knowledgable that he gave me confidence that you guys were the right people for the job. You yourself have been so helpful answering my many questions & the guys who did the conversion were amazing. I still can't believe that a mammoth job like this was complete in one day with minimal disruption! And what amazed me even more was that the house was left as clean as it had been before the work started - I couldn't believe it when I saw one of your guys hoovering before they left!! We've had a lot of work done to our house recently and every other work man that's been here has left an almighty mess! I will 100% be recommending you guys to my neighbours who are already asking about our conversion! 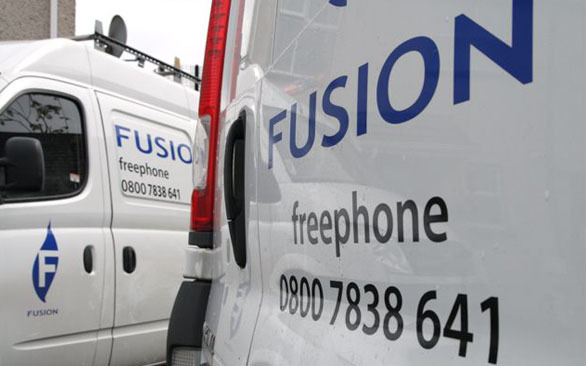 "All the Fusion staff are friendly and quick to help making the installation and paperwork easy and straightforward. The 'done in a day' service was a huge help in our circumstances and the onsite team were a pleasure to have around. After-sales service was superb whilst I got used to how the new boiler worked. Nothing seems too much trouble to this team." 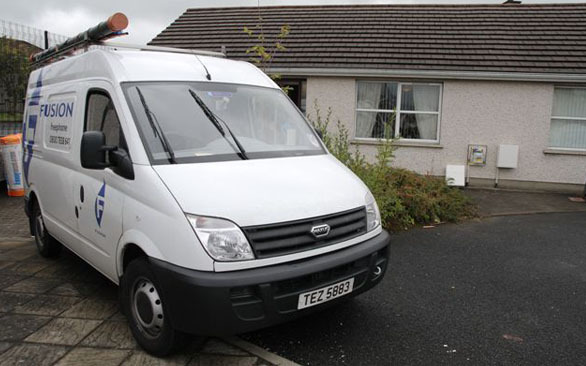 "Alan carried out my survey, explained in detail what would be done and gave me a quote. I chose my bathroom suite and tiles and Fusion came along and carried the work just as Alan had said. The guys on site were amazing - polite, well mannered, clean and tidy. Thank you Fusion so much. I would have no hesitation in recommending Fusion to carry out a bathroom refurbishment in your home."